Welcome to the five-day e-course "About Saltwater Aquariums 101 Getting Started." This course was designed to help you through all of the steps of setting up a new saltwater aquarium, from deciding where to locate your new aquarium to selecting the right aquarium for your situation to stocking the tank with fish, invertebrates and corals. Just follow the steps in order and your new tan will be up and running in almost no time at all. Almost 50 years of combined experience with saltwater aquariums is behind the writing of this course. We have made almost every mistake in the book (and added a few of our own making) during these years, so we are going to help you avoid these missteps and make your transition into saltwater aquariums much smoother. On this, the first day, we will be determining the location as well as the size of your new tank and what type of tank (Fish Only, Fish Only With Live Rock or a Reef Tank) you will have when you are done. Fish Only (FO) tanks are the simplest, being only a functioning tank with filtration, lighting, a few fish and some decorations in it. FO tanks require a minimum of equipment, the least amount of maintenance and are the easiest to set up. Many aquarists start with a FO tank to begin with, with the intent to gradually build the tank into a full on reef tank as their funds and experience increase. Most new saltwater aquarists begin with a Fish Only With Live Rock (FOWLR), which is probably the best approach since it includes the Live Rock which is an integral part of the biological filter and also the perfect foundation for the corals to be included in a Reef Tank. FO and FOWLR tanks require a minimum of tank lighting since none of the tank's occupants are photosynthetic. You will find that your tank lighting is the most expensive part of building a reef tank. The good news is that the newest in reef tank lighting (LED's) is becoming more and more reasonably priced. As each new advance in LED lighting comes to market, the prices of the old (still really great) LED lights drop dramatically. Not sure what type of tank you want? Take a look at the tanks in the Reef Tank Photos Gallery to see what appeals to you the most. Before we get started, there are a couple of quick things that we need to get out of the way. Over the years, a number of rumors (unfounded accusations) have been generated and passes around as gospel. We call them the Top Saltwater Aquarium Myths. Most of these legendary myths were created by people who were somewhat new to saltwater aquaria, had some bad luck (inexplicable events) and created unfounded conclusions as to the cause of the problems. These false conclusions (saltwater aquariums are very difficult and expensive to set up and maintain) or myths have been passed around for years and have caused a number of people who were interested in starting a marine aquarium to either settle for a freshwater aquarium or give up having an aquarium all together. Be aware of the "myths" and don't fall into the trap of believing them. Setting up a saltwater aquarium and keeping marine fish, invertebrates and corals isn't nearly as difficult as it used to be now that the biology of the ocean is much better understood. Even beginners can now successfully keep fish and corals that used to be thought of as almost impossible without a degree in marine biology. Many beginners make the same mistakes that previous beginners have made when setting up their first aquarium. It may be because they heard and believed the "myths". We call these the 10 Most Common Mistakes. Everyone makes mistakes; it's a part of being human. Do yourself a favor and learn by other peoples' mistakes. It is a lot cheaper and less frustrating that way. The size of your tank and the location go hand in hand. Obviously, you will not be able to put a 180 gallon tank on the night stand next to your bed. 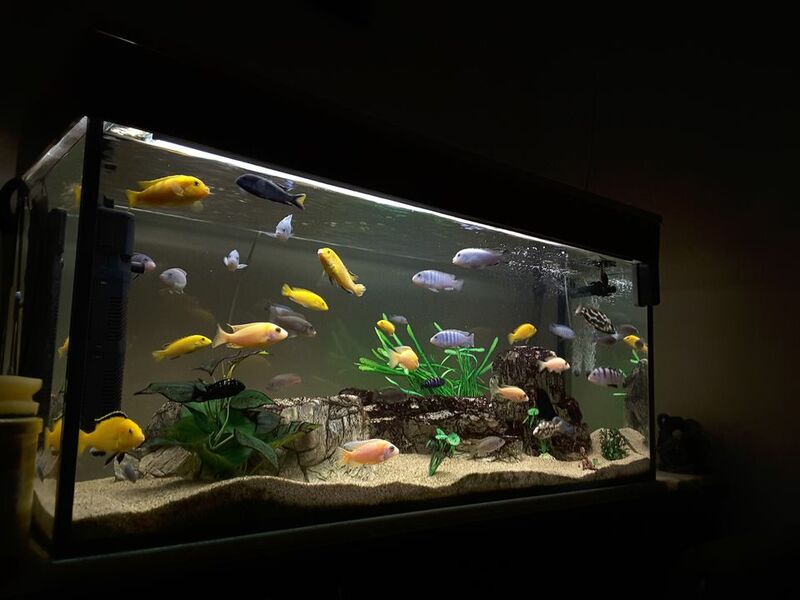 Choosing the right location for your new tank is important since once you have installed it, you will not want to move it (water, glass, sand and rocks are very heavy). There are also a number of factors that can make a location good or bad that you might not think of right off hand. Traffic patterns and ambient light are just two of the things to consider. Now that you have decided where you will be placing your new tank, you can Choose Your Tank, Stand & Hood which will work for the space you have. There are a number of aquariums (compare prices of Mini/Nano Kits, 1 to 50 Gallon Aquariums and Showsize Display Aquariums) on the market which may work for you. If you enjoy creating things on your own as well as saving money, DIY Glass Aquarium Plans and DIY Aquarium Cabinet/Stands may be for you. That's it for day one. Tomorrow we will be choosing your aquarium filtration system as well as planning a course of action for the inevitable power outages that will happen.